Butterfree in game: 1,451 Who? Important notice! Pokemon Butterfree is a fictional character of humans. Butterfree (Japanese: ??? ?— Butterfree) is a dual-type Bug/Flying Pokémon. 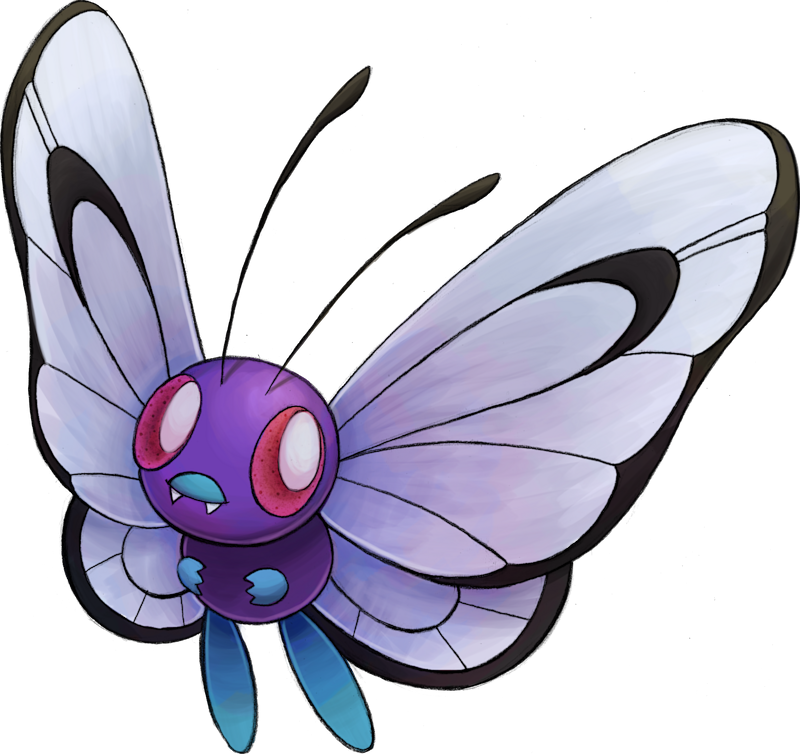 Butterfree resembles a vaguely anthropomorphic butterfly with a purple body. Unlike true insects, it only has two body segments and four light blue legs. The upper pair of legs resemble small, three-fingered hands, while the lower pair resemble long, digit-less feet. 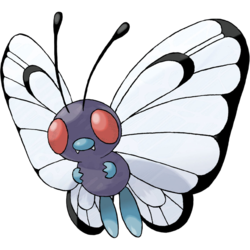 Butterfree has two black antennae, a light blue snout with two fangs underneath, and large, red compound eyes. Its two pairs of veined wings are white with black accents. 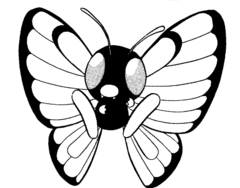 The oval scales of a female Butterfree's lower wings are black, but white in males. 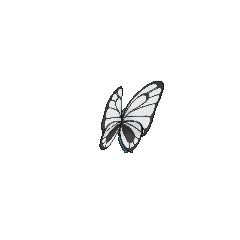 Butterfree's wings are covered with poisonous powders that fall off continuously as it flies. This powder repels water, enabling it to gather honey even in the rain. Butterfree will roam up to six miles from its nest in search of honey, which it carries with the hairs of its legs. It also consumes sap from trees pierced by Heracross, as seen in the anime. 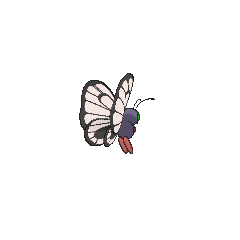 Butterfree is found in forests, but has also been observed flying near the ocean as part of its migratory breeding pattern. Ash Ketchum had a Butterfree that he had caught as a Caterpie, the first Pokémon he ever caught. Butterfree was also the first Pokémon Ash let go, allowing him to mate with a Pink Butterfree in Bye-Bye Butterfree. A pink Butterfree appeared in Bye-Bye Butterfree. Ash's Butterfree fell in love with her and fought to save her from Team Rocket. At the end of the episode, Ash released his Butterfree to mate with the pink Butterfree. Ritchie has a Butterfree named Happy. It was first seen in A Friend in Deed. An Orange Archipelago variant of Butterfree living on Valencia Island appeared in Poké Ball Peril. It had not eaten for days despite Professor Ivy's effort to make different kinds of food for it. It took a liking to Brock's food, however, and was one of the reasons he stayed behind. It reappeared in a flashback in A Tent Situation. A Butterfree appeared under the ownership of Lisa in Spell of the Unown: Entei. Jeremy used a Butterfree in the first half of the Silver Town Pokémon Contest in Weekend Warrior. Drew has a Butterfree that debuted in The Unbeatable Lightness of Seeing. Multiple Butterfree appeared in Butterfree and Me!., including one which Ash helped to evolve. A Butterfree appeared in SM008. A Butterfree appeared in The Path to the Pokémon League under the ownership of A.J.. Multiple Butterfree appeared in Battle Aboard the St. Anne, The Power of One, A Sappy Ending, Celebi: Voice of the Forest, Pokémon Heroes: Latios & Latias and Destiny Deoxys and Giratina and the Sky Warrior. 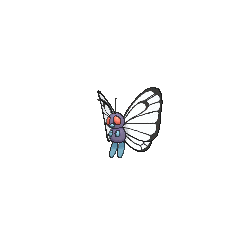 A Butterfree also appeared in Pokémon Fashion Flash, The March of the Exeggutor Squad, Pallet Party Panic, Once in a Blue Moon, Curbing the Crimson Tide! and Pinch Healing!. A flock of Orange Archipelago Butterfree living on the Seven Grapefruit Islands appeared in a flashback in Snack Attack. An Orange Archipelago Butterfree under the ownership of an unnamed Trainer appeared in The Mandarin Island Miss Match. An Orange Archipelago Butterfree living on Shamouti Island appeared in Slowking's Day. Three Butterfree were seen at Professor Oak's Laboratory in The Rivalry Revival. Multiple Butterfree appeared in For Crying Out Loud where they played with Wilhomena's Marill. A Butterfree was one of the Pokémon seen at the Pokémon Swap Meet in Tricks of the Trade. A flock of Butterfree were seen flying over Mount Quena in Mewtwo Returns. Multiple Butterfree appeared in the wild in Houndoom's Special Delivery. Several Butterfree appeared in Brock's dream in Sick Daze. A Butterfree was one of the inhabitants of an oasis just for Pokémon in Got Miltank?. A Butterfree appeared in A Tyrogue Full of Trouble where it was followed by Misty's Togepi. Two Butterfree were seen at Lake Slowpoke in Enlighten Up!. Several Butterfree were among the inhabitants of the Dragon Holy Land in Fangs for Nothin'. A Butterfree made a brief appearance in Camp Pikachu. A Butterfree appeared in Now That’s Flower Power! as a Pokémon in the Contest. In Channeling the Battle Zone, Solidad used her Butterfree in the Kanto Grand Festival. A Butterfree appeared in Camping It Up! It was also seen as part of Lila's famous "Tiger Lily Smile" background in Battling the Generation Gap!. A group of Butterfree also appeared in Genesect and the Legend Awakened at Pokémon Hills. A Butterfree appeared on the picture in the gallery museum in A Blustery Santalune Gym Battle!. A Trainer's Butterfree appeared in A Relay in the Sky!. A Butterfree appeared in A Legendary Photo Op!. A Trainer's Buttefree appeared in Alola to New Adventure!, during a flashback. 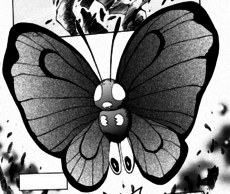 A Butterfree appeared in SM003, as a silhouette. Butterfree debuts in Wake Up—You’re Snorlax! as one of the Pokémon shocked by Red's Pika in a forest. Yellow's Butterfree, nicknamed Kitty, evolved from her Caterpie that had just recently evolved into a Metapod in The Might of... Metapod?!. Her uncle, Fisherman Wilton, also has a Butterfree which first appeared in Just a Spearow Carrier. Both of them are able to use Butterfree as a mode of flight, using Butterfree to hold onto their backs as they fly. 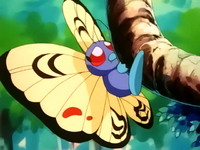 In The Last Battle XIII a Butterfree was one of the Pokémon sent to help the fight in Ilex Forest. 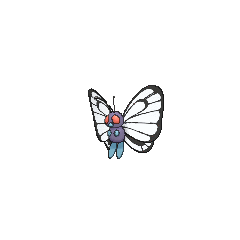 Butterfree is a combination of butterfly and free, possibly referring to its ability to fly after being grounded for two evolutionary stages. In Japanese, the name may also derive from the word ?? furu (to flap, as in wings).